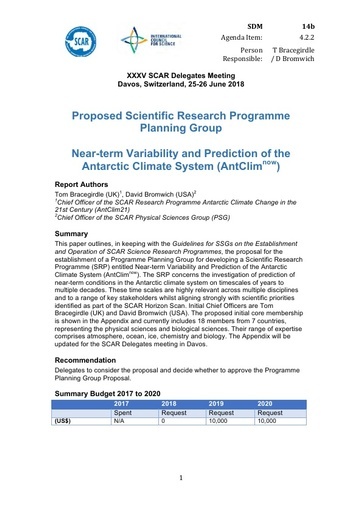 This paper outlines, in keeping with the Guidelines for SSGs on the Establishment and Operation of SCAR Science Research Programmes, the proposal for the establishment of a Programme Planning Group for developing a Scientific Research Programme (SRP) entitled Near-term Variability and Prediction of the Antarctic Climate System (AntClimnow).The SRP concerns the investigation ofprediction of near-term conditions in the Antarctic climate system on timescales of years to multiple decades. These time scales are highly relevant across multiple disciplines and to a range of key stakeholders whilst aligning strongly with scientific priorities identified as part of the SCAR Horizon Scan.Initial Chief Officers are Tom Bracegirdle (UK) and David Bromwich (USA). The proposed initial core membership is shown in the Appendix and currently includes 18 members from 7 countries, representing the physical sciences and biological sciences. Their range of expertise comprises atmosphere, ocean, ice, chemistry and biology.The Appendix will be updated for the SCAR Delegates meeting in Davos.